The perfect cycling cruise starts in Normandy, not far from the famous D-Day coast. 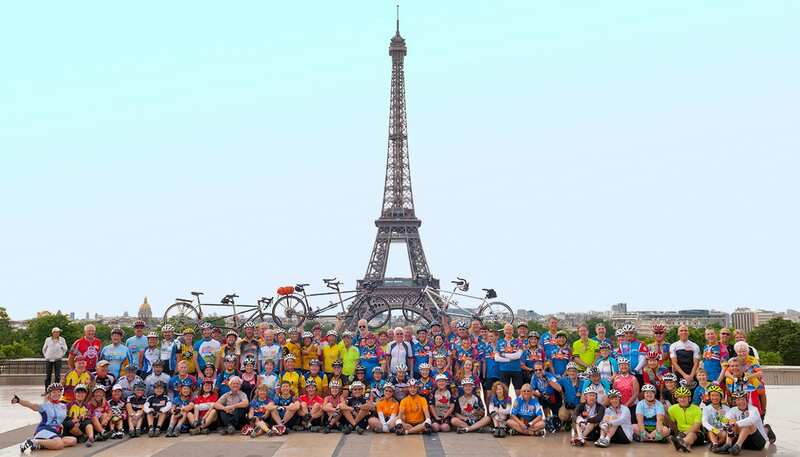 Embark day for Santana’s Normandy to Paris Cycling Cruise is Monday July 13th. On that Monday two summers from now we’ll retrieve you and your luggage from Paris CDG-airport and get you to our luxurious river cruise ship in time to check in, freshen up and assemble your tandem or single bikes for a short test ride. Most participants will opt to arrive at CDG three days earlier (July 10th) for a bargain priced PreTour that includes our insightful exploration of the D-day coast. Our luxurious home for 8-days and 7-nights is Lüftner’s Amadeus Diamond. Launched in Spring of 2010, Santana chartered the Diamond that same summer for our original Paris to Amsterdam cycling cruise. More recently Lüftner refitted this luxurious river cruiser for her relaunch on the Seine. Santana tested the improvements during our 2017 Seine River Cycling Cruise, a premiere event that sold out in two days. One of our rides ends at the Castle of Richard the Lionheart, the British monarch who ruled this part of France until the Normans surrounded his formidable castle and starved its defending army. After his army surrendered the locals ripped apart the castle’s defenses to dishearten Richard’s return. A different day’s ride pauses at La Roche Guyon, a castle built into the side of an overhanging wall of rock. While most of Europe’s castles were obsolete by the 20th century, when General Rommel arrived in Normandy to beef-up German defenses in advance of suspected allied landings, this secure cliffside fortress provided ample protection against allied air raids. In addition to huge castles and cathedrals, our multi-day approach to Paris passes chateaus and abbey churches. Because the Seine River was central to the pioneers of impressionism and post-impressionism, we’ll cycle past buildings, bridges and landscapes that appear in the works of Degas, Boudin, Pissaro, Cézanne, Sisley, Van Gogh and Renoir. One ride passes through the Seine River village of Girverny, and stops at the famous home of Claude Monet, the founder and leader of impressionism. A Parisian who studied art from age 11, Monet created impressionism while capturing Seine River scenes between Paris to the sea. At age 43, no longer content to reside in Paris, Monet moved his family to Giverny where he lived and painted for another 43 years. We’ll park our bikes to tour the artist’s home, outdoor studio, artistically crafted gardens and the lily pond that dominated Monet’s final chapter. On any day of this pretested adventure you can ride hard, easy, or not at all. Since it’s your vacation you can sleep in before an afternoon ride, or ride early before enjoying an afternoon cruise. Tired? On this tour you can nap and/or enjoy a spa treatment (the Amadeus Diamond has a spa and masseuse!). A favorite pre-dinner gathering spot is certain the ship’s lounge with its big screen TV, where you’ll be able to watch each day’s finishing sprint as the Tour de France approaches Paris. After 4 full days of cycling (7 if you joined us for the D-Day PreTour), the final two days of rides finish before lunch. Saturday’s morning ride uses traffic-free avenues to enter Paris, where the ship will be remain docked through Monday in the shadow of the Eiffel Tower. While nothing prevents an apres-lunch ride, Saturday is the perfect afternoon to explore Paris. If you skip the ship’s dinner and/or stay out late, we’ll leave the light on. Our Sunday morning ride is one you’re certain to remember. From Santana’s tours that started or ended in Paris (2010, 2013, 2016, and 2017) we know the perfect spot for our group photo. With a bit of luck we may fit Eiffel’s tower and our cruise ship into the same group shot. A few blocks farther we’ll reach the police barricades that prevent traffic from entering avenues that will be used for this afternoon’s finish of the 2020 Tour de France. Thanks to Santana’s multiyear relationship with ASO (the organization that produces Le Tour), we’ll be able to ride the final miles of our tour on the same circuit where, a few hours later, a slightly larger number of pros will ride the final miles of their tour. After you circle Arc de Triomphe to head back to the ship our photographer will capture an action shot with the Arc in the background. Back at the ship we’ll regroup for high fives and bike packing. After lunch it’s a short hike back to the circuit, where you’ll have time to find a viewing spot before the appearance of the commercial caravan. A low-flying formation of fighter jets announces the arrival of the pro peloton, which rides seven laps up and down Champs-Élysées before the finishing sprint. While standing amidst a crowded mass of fans is fun and free, ASO will again allow Santana’s participants the option to obtain prime seats in their reserved-for-sponsors compound. This VIP pavilion at the face of the curb (in a secured area with gourmet catering and flush toilets) allows an unobstructed view of this afternoon’s action. Location? Santana’s seats are along the finishing sprint, directly opposite the press-boxes. From this perfect spot on Avenue des Champs-Élysées you’ll have unobstructed view of the riders, who pass in front of us fifteen times in the course of 90 minutes. This prime location produces flashy breakaways by riders who hope to be out front when the peleton passes the press boxes, announcer’s stand and TV cameras. The final sprint is always contested by riders who hope to win the final stage — and collect a yellow jersey a few minutes before the overall winner stands atop the same podium. While tens of thousands of spectators will party until the start of the fireworks, from our grandstand it’s also possible to make a quick exit out the rear gate. Arriving back at the ship within twenty minutes, you’ll have time to pack before our tour’s farewell dinner. Unless you decide to turn in early, the after-dinner fireworks can be viewed from the Diamond’s top deck. On the morning of July 20, 2020 our included ship-to-CDG shuttles can get you to the airport in time for the earliest transatlantic departure. After testing this new itinerary in 2017—when cyclists rated it “perfect”—our fans who missed that premiere have been waiting for this week’s announcement. Was it worth the three-year wait? While other organized tours have undoubtedly arrived in Paris to witness a Tour de France finish, did their participants cycle the Champs-Élysées circuit before taking a reserved seat at the finish line? While reminiscing about the great times we shared on our 2017 Seine River Cruise, Jan remarked on the luxury and comfort of the Amadeus Diamond. 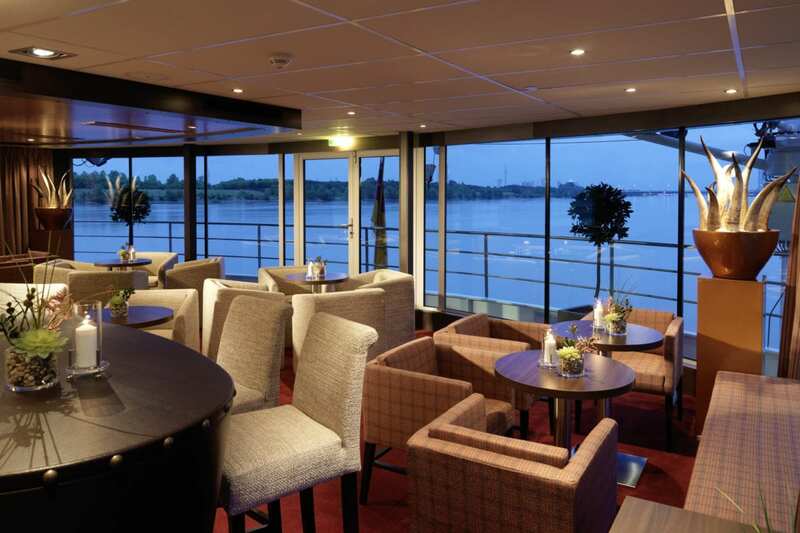 Lüftner Cruises designed the Diamond to be the most luxurious ship on Europe’s Rivers. It is the perfect place to dine, sleep, and relax between rides. The Mozart & Strauss Deck staterooms have French Balconies. You’ll both be able to lean out to share beautiful views up and down the river. All double-staterooms are 161 square feet, plenty of room for a king-width bed. Suites are about 50% larger (237 square feet!) and provide room to entertain your friends. The Haydn Deck Staterooms have a tall and wide fixed window. With the same floor-plan and amenities as upper deck staterooms, you can’t tell which deck you’re on with the curtains closed. Morning and mid-day dining includes bountiful buffets created by our 5-star chef. Each evening your waiter will present a new five course menu—listing an array of choices for you to select from. Is Beer & wine included with dinner? Of course! The forward Panorama Lounge/Bar has 270-degree views and seating for all our guests. The Amadeus Club is a more intimate venue at the rear of the ship. Both the Lounge & Club are great places to relax, catch up on emails, post a few photos on social media, or read a nice book. A: July 13 to 20, 2020. 8-Days/7-Nights. A: Due to the current strength of the dollar our first-in per-person pricing for this 8-day cycling cruise starts at $3,999 per-person. Booking early is easy and RISK FREE. Our reservations page shows pricing of available staterooms. A: Jan and I don’t accept tips. A comprehensive “cruise extras” fee of $500 per person includes a long list of port fees, off-ship activities, admissions, interpretive guides, sight fees, and ride support (gps route files, morning shuttles to give casual riders a head start, and an SOS van driven by a pro mechanic). Note that this is less than the average cruise passenger pays for week of “deluxe excursions.” Shipboard gratuities of $150 per person includes wash & fold laundry and valet bike handling. Q: Are all the staterooms the same? A: No. 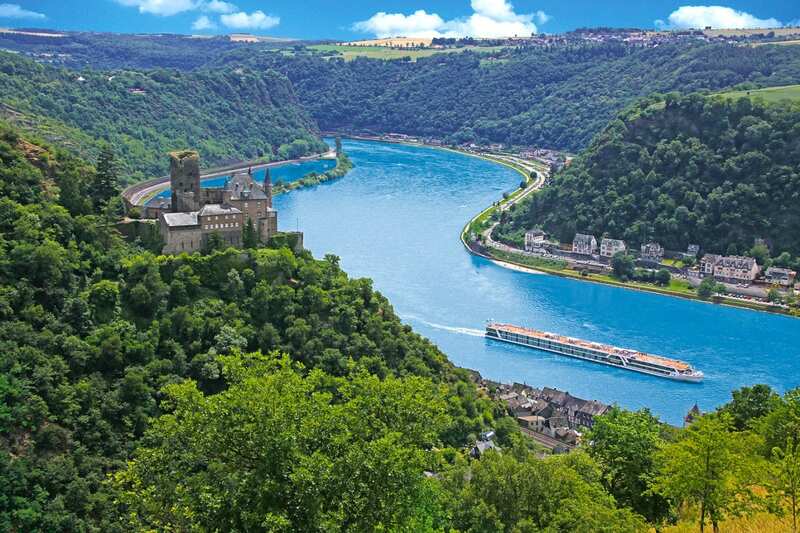 Lüftner Cruises designed the Amadeus Diamond to be the most luxurious ship on Europe’s Seine River. It is the perfect place to dine, sleep, and relax between rides. The Mozart & Strauss Deck staterooms have French Balconies. You’ll both be able to lean out to share beautiful views up and down the river. All double staterooms are 161 square feet, and suites are about 50% larger (237 square feet!) and provide room to entertain your friends. The Haydn Deck Staterooms have a tall and wide fixed window. With the same floor-plan and amenities as upper deck staterooms, you can’t tell which deck you’re on with the curtains closed. A: In any sub-category all rooms are identical. Using the PayPal timestamp, those who reserve earliest get the conveniently located staterooms closest to the front of the ship. If friends desire a pair of adjacent staterooms the timestamp of the first reservation determines the location of both rooms. In short, out of fairness to all our guests, we will not take requests for specific room numbers. Those who book early obtain prime positioning. A: Yes. If you own a nice bike that fits, however, bringing it with you is relatively easy and inexpensive. More info on this in Bill’s Travel Tips. Single bike rental rates are about $450 per person for the event, includes delivery to Normandy PreTour (or embark) and retrieval from Paris at disembark. A: Detailed info by August ’19. Those who arrive and leave on the embark and debark days will receive FREE Airport transfers. A: In addition to our daily pair of zero-mile options (remaining on the ship or exploring the islands via Sergio’s Coach), every day has multiple cycling routes. Anyone who can ride 35 flat miles will be able to enjoy cycling in both regions. If you prefer hills or want to spend additional hours in the saddle, we’ve got you covered. At each morning’s breakfast you’ll get a map charting the day’s cycling routes and recommended stops. During a brief route talk you’ll hear about each route’s grades and difficulty. Santana’s vets have learned to love and rely on their handlebar-mounted gps units. Available for less than $200, these touch-screen marvels prevent the age-old problem of getting lost or riding unplanned miles. Santana supplies free electronic mapping and route files. Simply select the route and follow the highlighted map. Q: Does the Amadeus Diamond have WiFi? Does the ship have an elevator? A: The easiest way to get help is by phoning or emailing Matt, who is happy to help answer your questions. Full Cancellation policy appears below. Your deposit signifies an acceptance of those terms. Our comprehensive “cruise extras” fee of $500 per person covers a long list of port fees, off-ship activities, admissions, guides, rider support, SOS-Vans, and our non-cyclist panoramic-window coach. Crew Gratuities of $150 per person will be collected at the event. Because cruise ship charters are binding, non-cancelable contracts, Jan and I will only enter into this charter based on your confirmed-with-a-deposit commitment. In effect, we undertake a huge risk by guaranteeing full payment on your behalf. After entering into this obligation, we cannot afford for you to back out, for any reason. This is the same policy that existed on all but 1 of Santana’s 53 previous cruises. While preparing for our 2009 Danube event, I neglected to include the following provision (shown below). That’s the year a group of friends, after verbally agreeing to pay in full and then stringing Jan along for many months, decided to cancel their plans. Lesson learned!